Jesus was saying essentially that the bond between husband and wife is a sacred union. Jesus made it clear that God's design for marriage is sacred, permanent in this life, and not subject to change. The biblical formula for marriage is between one man and one woman. The scriptures are abundantly clear about that. God's design for marriage is beautiful, artistic, and a wonderful joy. Unfortunately there is a progressive element in the world today that seeks to redefine and change things in society to reflect the subjective views of a select few of elite social engineers. Increasingly there is a faction of society in the west that wants to change and "evolve" society as they see fit. There is a lot of money and support behind this movement. Today, there is mounting pressure in Europe, Canada, and the United States for Christian organizations to turn coat on the issue of marriage, gender, and other concerns. In recent years some Christian organizations and denominational movements have made moves to change their marriage doctrines to allow for gay marriage to be practiced. The arguments have been that this is about love, inclusion, tolerance, and equal rights for gay couples. The results have overwhelmingly been that there is a mass exodus from the movement. And with the core principles of the churches compromised, soon other compromises come about, and the movement dies off completely. We must never, never, never endorse a practice that the scriptures show clearly to be sinful. So in your life and witness, you may come across Christians or groups of individuals, or activists who will be working within your church movement to get the movement to embrace gay marriage, gender ideology, and other non-biblical positions on issues of the day. I'm encouraging you today to boldly stand up against these attempts to circumvent God's word. I'd like to arm you today to contest with these activists and show from God's word the plain truth of God's design for marriage. Let's take a look at some scriptures. 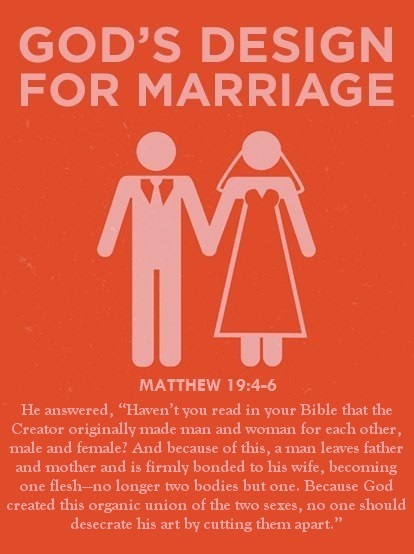 Another attack levied against biblical marriage are ceremonial laws of the Old Testament. The objector will start listing off ceremonial and judicial laws from the Old Testament, mainly from Exodus and Leviticus. They say: "Do you eat pork? Do you eat shell-fish? Should you stone your wife if she commits adultery? Do you think a woman who is on her period is unclean? How can you pick and choose!" Here's the deal: When you debate with someone who is attacking God's design for marriage and pushing the gay marriage issue, especially within the church, if you debate with them long enough you'll notice that behind their objections is one prime factor: They reject the authority of scripture. They don't really believe the Bible is God's word. That is the problem. The solution is to rally people to His word and invite them to believe it. Let me be clear: That is the issue with people within churches. For those outside churches, biblical arguments aren't going to have any sort of impact, because they don't recognize even partial authority in the scriptures. They reject them as the creeds of evil men bent on misogyny and bigotry. We know they are not that, but that's how they are thought of in modern culture. There is a very simple question to ask: Is the Bible the word of God? If the answer is indeed "yes" which it always ought to be, then we have absolutely no business encouraging that which God has forbidden. It's just that simple. At the end of Romans 1 Paul also writes: "Although they know God’s righteous decree that those who do such things deserve death, they not only continue to do these very things but also approve of those who practice them." (v.32) Do we want to join the growing number who have decided to approve of those who practice such behaviors? Of course not. 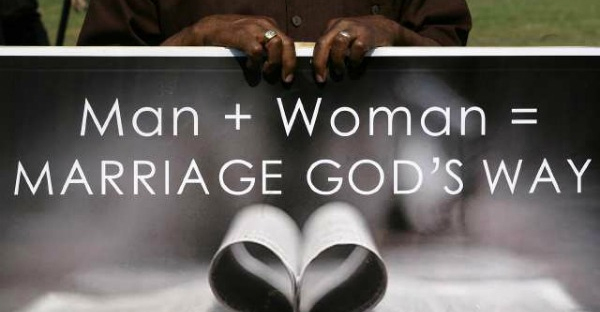 So I encourage you, take a stand for God's beautiful, wonderful design for marriage. Watch this testimony by Dennis Jernigan titled "I Used to Be Gay." It will open your eyes to the redeeming power of Christ! This is a very tough issue. Let me repeat that: this is a very tough issue. The culture is quite convinced that anyone standing for natural marriage is on the same level as the most demented, backwards, evil bigot. Human rights organizations have and will condemn anyone who dares to a take a stand on this issue. Those who stand for natural marriage have been and will be called hate-mongers, bigots, homophobes, and discriminatory religious zealots. In fact government human rights organization called "religious liberty" code words for bigotry and hatred. But it's worse than that. Sadly gay activists have taken to suing Christian businesses, slandering Christians who take a stand, and getting Christians fired from their jobs for standing for their religious values in the public square. Some in the government wage a war on religious liberty, demanding that Christian business owners be forced to participate in gay marriage ceremonies or be shut down and fined hundreds of thousands of dollars. That could very soon continue forward into the area of ministry and pastoring. The Obama/Loretta Lynch Department of Justice was demanding that gender be redefined and that all public schools and public institutions be required to have a transgender bathroom policy. Thankfully the Trump/Jeff Sessions DOJ reversed that edict. But it's clear that many along the political spectrum see it as the government's job to socially engineer culture and require that Christians be forced to come along for the ride, and if they resist, they will be fined, charged with crimes, or put in jail. Even if you don't have any interest in politics, watch out, because politics is taking an interest in you. Many top companies in the U.S.A. have taken to bullying states to push forward the redefinition of marriage and gender. National companies may boycott you or your entire state, as Indiana was boycotted for attempts to protect religious liberty and how North Carolina was boycotted by musicians, employers, and over 120 different major U.S. companies. Some of the companies involved included: The NFL, the NBA, Paypal, Starbucks, Microsoft, Facebook, Twitter, Pepsi, Whole Foods, Hyatt, and many others. We may find ourselves attacked, boycotted, and slandered for defending natural marriage, but who do we want to be? God's people or the favorites of the world? God is real. He is active in the world. God's Bible is real, true, and infallible. It is the description of God's timeless truths. Thus when the Bible tells us something is sinful, we must never call it anything but that. There have always been heavy pressures from the cultures we engage in. Should we change our marriage stance? Should we encourage that which God has forbidden for the affection of the LGBTQ community, for the acceptance of U.S. businesses, for the sake of "equality and inclusion?" Never. Because it doesn't matter what happens to us, live or die, fired or labeled haters, none-the-less, Christ lives! And though heaven and earth pass away, His word will never pass away. It's truth is eternal. When debating with non-believers remember to be wise, kind, and polite. As 1st Peter 3:15b says "Always be prepared to give an answer to everyone who asks you to give the reason for the hope that you have. But do this with gentleness and respect..." When dealing with a secular non-believer remember to make it clear that God wants all to come to repentance and to be found in the love of Christ. Homosexuality is a sinful practice, but it's not a special sin. Many wonderful former-homosexual individuals are now shining witnesses to the power of Christ, just as I try to be a shining example of how Christ loves and redeems drug addicts. Check out the Facebook page "Ex-LGBT Through Jesus Christ." When talking with a person who identifies as LGBTQ remember that you are dealing with someone made in the image of God. Invite them to know the love of Christ, invite them to church, and invite them to repent of their sinful practices and embrace Christ. Christ forgives all when we repent and come to Him! Our application of God's word adapts to the culture as it shifts. But the eternal truths found in God's word do not change. Marriage is a sacred union between man and wife, to the exclusion of any other combination. Let's carry the message of the gospel in the fullness of grace and truth, standing firm in His word despite what the culture demands. Here we stand, we can do no other. Please feel free to share this article and the pictures. Please consider being an active advocate in your area for a biblical foundation of marriage, family, and core theology in your church, organization, or movement. We need voices like yours, standing firmly for the truth. Thank you!